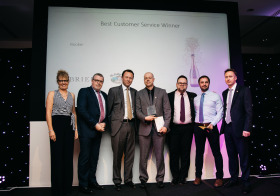 Family-owned garden centre group, Notcutts Garden Centres, has hosted its annual conference and awards dinner to celebrate the success of colleagues and teams across its 18 garden centres nationwide. Hosted on March 20 in Maldon, Essex, the conference recognised individual and business achievements over the past 12 months, with awards presented to outstanding team members who have gone the extra mile. Awards were presented to Notcutts colleagues for achievements across the business, including ‘Best Garden Centre Performance’, ‘Best Restaurant Performance’, ‘Planteria Excellence’ and ‘Best Customer Service’. ‘Frontline Hero’ awards were also presented to individuals who demonstrate excellence and go above and beyond to help customers and their team. Special long-service awards were presented to colleagues who have worked at Notcutts for 25 years. The Notcutts annual conference was sponsored by leading industry names; Bidfood, Briers, Esprit UK, Evergreen Garden Care, Gleeds, Hozelock, Kettler, McBains, Mr. Fothergill’s, Pelican, Porters, Sensormatic by Johnson Controls, Smart Garden, Stanley Bragg and Westland.